This in an interesting and thought-provoking post, thank you! I hope you don't mind if I ask you a question. It concerns what you mean by "individuals with greater intelligence probably have a greater degree of free will than those with less intelligence." (and I suppose more generally what you mean by degree of free will.) Do you mean that individuals with a higher degree of free will can make non-determined choices in more situations than those with less? I think the reason I am having trouble getting my head around this is that the only advantage I can see intelligence giving someone with respect to free will is that they might be able to think of more possible choices than a less intelligent person. But I don't think this leads to more free will. It's easy to think of programming a computer to react to some scenario, and give you all the options considered by the algorithm. The computer might consider many more possibilities than a human but it's final choice would be completely determined. I think what I'm trying to say is that I don't think intelligence and free will are necessarily related at all (though they could be). 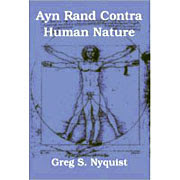 I've always thought the Objectivist position was pretty odd when it came to 'unsaddled' free will. I mean... why do some of her heroes become railroad managers and some engineers? I would say (in real life) that it's due to innate proclivity + environment + (some degree of) self-determination. I can't see how an Objectivist can say more than it's JUST due to self-determination which doesn't make any sense - then why would people pick different jobs? How could one person's self-determination lead to one choice and one to another if it's not influenced by some innate or environmental factor? It's far logical to have the situation you present (at least as I understand it). "If consciousness is efficacious, if the mind provides a contribution to human life that goes beyond merely physical processes, then free will, in some measure or form, has been established. In what precise measure or form is a question best answered, again, by consultation of the relevant facts." Although I'm not sure Rand would disagree, either. She did acknowlege factors other than pure choice. Tarendol: "I think the reason I am having trouble getting my head around this is that the only advantage I can see intelligence giving someone with respect to free will is that they might be able to think of more possible choices than a less intelligent person. But I don't think this leads to more free will." I guess it all depends on how one sees free will. I take free will to be the ability of the self or the mind to contribute to the decision process. The more intelligent the mind, the more it can contribute to that process. There are other possible ways in which free will could be "increased." There's a folk theory that says if you discipline your children, they will have more self-control when they grow up. If this folk theory is true, then this suggests that you can increase free will (i.e., increase the ability of self-initiative and thought to act against impulses). Of course, all this conjectural. The point of the post is to try to reduce the overly speculative problem of free will to something we can discuss in more empirical terms, so that we're not just reasoning about vague instructions which no one really understands in practical or empirical terms. "How could one person's self-determination lead to one choice and one to another if it's not influenced by some innate or environmental factor?" I'm not sure anyone knows the answer to the question. But I think it is obvioius that genetic and cultural factors play a role in decision making. The question is: how much of a role does "self-determination" play? I'm not sure the mind is well-equipped to figure that one out. After all, it's not as if knowledge of this sort would have given our ancestors a darwinian advantage over their competitors. Jay: "Although I'm not sure Rand would disagree, either. She did acknowlege factors other than pure choice." Perhaps not, although I do doubt Rand would like the phrase "in some measure or form," which implies an attenuated free will. As an aside, I am a subscriber of the Objective Standard. Not long ago I put in a request for an article on the biological basis of free will, perhaps written by Harriman or someone with a scientific background. I think it would be an interesting read. I see free will as self-evident because I exercise it every day, but I cannot argue with the sophistication of a scientist. Let's see if the article gets written someday. One last aside. Found this analysis of free will (or as the author spells it, "freewill) very interesting and in-depth. Check it out if you're interested. Jay: "One last aside. Found this analysis of free will (or as the author [Peter Voss] spells it, "freewill) very interesting and in-depth. Check it out if you're interested." Thanks for the link. A curious mixture of Dennett and Rand. My own position is superficially close to compatibilism, but is really quite different. I don't agree, for example, with Mr. Voss' view that thinking is mechanistic in a cause-and-effect way. If that were true, I don't see how free will, in any meaningful sense of the term, would not be possible. Indeed, I cannot help suspecting that Voss' compatibilism is simply determinism with one major amendment: the identification of the mental self with the determining forces. The forces that make me think and act as I do our my own forces. Those forces are my self. Voss has what I would describe as an irrational prejudice against pscyho-physical dualism — a prejudice shared by most secular thinkers, because of their paranoia of religious conceptions. But if the mental world is simply an extension of mechanistic material processes, a byproduct one might say, I don't see how that view is in fact "compatible" with freedom of the will. One other error to note in Voss' account of free will: "The decision to start thinking, to be focused, must be made by our minds," he writes. This is the Randian influence in his doctrine, and it's psychologically absurd. To be conscious is, ipso facto, to be focused. Free will involves choosing what to focus on, or what to think about. Every conscious person is focused on something, and is probably thinking about something as well. I do appreciate that Voss admits "degrees" of free will. At least we are allies on this point. But I do think his prejudice against psycho-physical dualism lead him astray on other issues.